The West Coast is also a magical region, a journey through time that allows you to discover the most ancient traditions in Gaelic culture and the essence of the country. 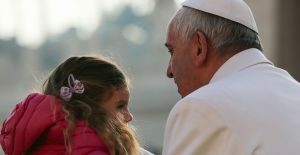 It is precisely in this area where the language and customs are best preserved, so it is not surprising that the hospitable inhabitants welcome you in Gaelic when you visit the Gaeltacht areas, where the Irish language predominates over English. Abbeys, castles and monasteries complete this journey through charming towns and villages in County Galway and Clare, who wrote the history of Western Ireland. Breakfast. Depart in your rental car towards Galway, through the rich pastures of the countryside. Along the way you will find the Victorian house, gardens and Belvedere park, on the shores of Lake Ennell. These sites inspired Jonathan Swift, author of “Gulliver’s Travels”. Before crossing the river Shannon, you can visit Clonmacnoise, an abbey and a monastery of the Christian faith. The next destination will be the lively city that gives name to the county. In the fifteenth and sixteenth century, Spanish ships would stop off in Galway port to trade. That is why, even today, monuments like the “Spanish arch” recall the good relationship between the two countries. 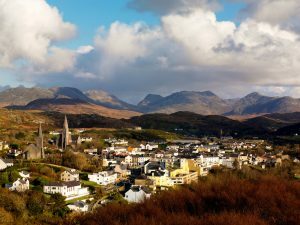 After breakfast, we recommend that you head to the Connemara Region, north-west of Galway, famous for the wild beauty of its landscapes, lakes, mountains and hidden valleys. 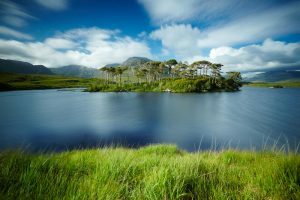 The wonderful landscape will accompany you throughout the tour, where you can visit the Connemara National Park. Irish red foxes and deer roam freely among mountains, marshes and meadows. In addition, the park houses remnents of human civilization, like megalithic tombs 4,000 years old. Do not forget to visit the magnificent Kylemore Abbey, which formerly belonged to the grounds that now make up the national park. For accommodation, choose one of the many guest houses in the area. Next, we invite you to get lost in the Connemara region, which harbours the most ancient traditions in a genuine Irish landscape. In little pockets along the ragged coast, in areas called the Gaeltacht, people still speak the Irish language. The sounds of uileann pipes and tin whistes flood the lively pubs of the area. If you take yourself inland, you will discover the Twelve Bens mountain range, a mountain range with peaks between 500 and 700 meters, which delight the hikers in summer. The next day, the journey continues through Galway to County Clare. Clare’s natural attractions will awaken your admiration at first sight. 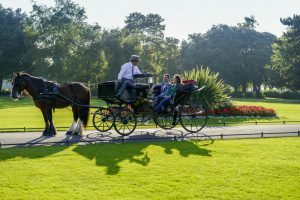 The county is full of exceptional landscapes, from the rugged charm of the Atlantic coast, whipped by waves and wind, to the famous Shannon River and Lough Derg, located on the east side, where you can enjoy charming villages such as Mountshannon and Killaloe. You mustn’t miss the spectacular Cliffs of Moher, which rush over the coast of the Atlantic Ocean and extend for eight kilometers. They reach an impressive height of up to 214 meters. Select a guest house for the night; in this area there are many with spectacular views. On the final stretch, travel with your rental car inland. During the tour you will pass through small towns and typical Irish villages. The visit to the Castle “Rock of Cashel”, in the heart of County Tipperary, one of the most visited places in Ireland, is a must. It is an ancient fortress dating from the 12th and 13th centuries, the throne of the Elderly Kings of Ireland before the arrival of the Normans. The castle rises majestically on a hill and represents one of the best Celtic and medieval architectural examples. In addition, it is said that it was here that the King of Munster was converted to Christianity by St. Patrick in the 5th century. The high Irish crosses found in this enclave have become iconic designs of the country’s jewelry. Then head for the night to the town of Kilkenny, famous for its medieval buildings and local crafts. Kilkenny is the last city we suggest you visit before heading to Dublin. The journey continues for a little more than an hour and a half, so before you leave, you can take the opportunity to visit the famous 12th-century Norman castle of Kilkenny, visit the 13th-century Black Abbey which contains one of the most spectacular rosettes in Ireland, with 10,000 pieces of ruby ​​and sapphire glass, or take advantage to buy some souveneirs. The farewell night will take place in Dublin. After more than a week of travel, surely the memory of the West Coast remains engraved forever in your heart It’s time to bid farewell to the wild landscapes, the kilometer-long beaches, the Celtic customs, the stunning cliffs and the Irish hospitality. Make your way back to the airport, to return the rental car and take off for home. On the first floor, the process of brewing is explained. A large room contains the old machinery used in the factory: a mill, a toaster, a alembic and giant wooden barrels. 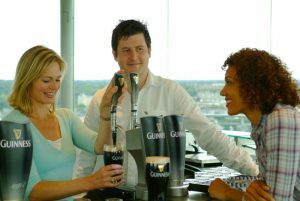 For its part, the second floor offers the visitor an interesting tour through the history of this emblematic beer that you will know thanks to the advertising campaigns developed by Guinness throughout history. On the third floor visitors are offered the possibility to test their knowledge about alcohol through different interactive games. On the fourth floor an exhibition tells the history of the building, from 1904 until its conversion in 2000 into a visitor center. 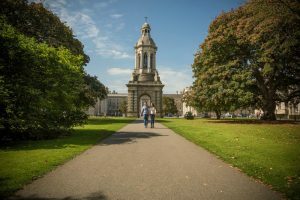 The restless city of Galway at the end of September celebrates a festival that is a hit with seafood lovers; it is the International Festival of Oysters and Seafood, which in 2017 celebrated its 63th year. Over the course of a weekend, the city dresses up and thousands of people gather together and have the chance to taste more than 10,000 oysters. Those who are not a fan of this succulent delicacy of the sea, should not let that stop them! In the year 2000, was described by the Sunday Times as “one of the 12 greatest events on earth”. The festival also has an interesting competition to determine who is the fastest oyster opener on the planet. “Irish Oyster Opening Championships” is the name given to the opening competition of Oysters. The entrance costs about € 40 and includes, in addition to the show, food and drink. Look for pubs featured on the Guinness Oyster Trail, about 30 spots in the city, where you can taste the select seafood while enjoying a pint of Guinness. Dun Aengus Fort is located on the island of Inishmore, on the edge of a cliff 100 meters high. 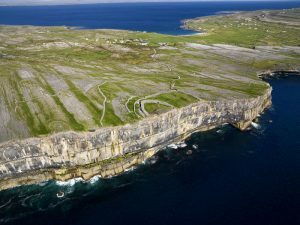 It is the largest prehistoric fort in the Aran Islands and its name means “Aengus fort” in reference to the god of Irish mythology. It is formed by four concentric walls, that in some points, reach four meters in thickness. In addition to its use to defend the westernmost point of Europe, it could be used as a place of worship for the Druids. From the fort, you can enjoy the spectacular view that extends for 120 kilometers of coastline. The guide or brochure is not available in Spanish. For visitors traveling with children or people with reduced mobility, the visitor center located at 900 meters is a good alternative, as they can discover the history and functions of the fortress avoiding an uneven road. 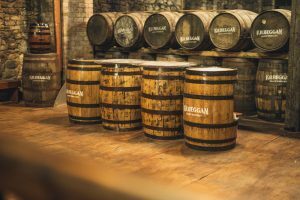 On the way to Galway, an hour’s drive from Dublin, you will find the Kilbeggan Museum Distillery, a unique visit to one of the oldest whiskey distilleries in the world. Its walls hide 256 years of tradition in producing this precious whiskey. It is located on the waters of the river Brosna and in its facilities a mill was built to take advantage of the fluvial force and to move the machinery. The guided tour allows you to find out about the facilities in perfect condition (originating from 1757) and to attend a tasting to try the distillery’s different whiskeys. Although today it functions as a museum, you can see the entire process of distillation initiated by the traditional mill. They have different guided tours, although you can opt for the self-guided tour, from € 7. Children under 18 years old can Access the museum, but not consume alcohol. For drivers, they have a reduced tasting. 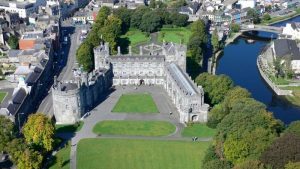 The picturesque Kilkenny Castle, a site located in the center of the town, is a Norman fortress with more than eight centuries of history. It is one of the largest castles in the world and is one of the most visited places by tourists. There you can lose yourself in its three wings and six floors full of artistic treasures. The Butler family came to Ireland with the Norman invasion, and the castle belonged to them until the mid-twentieth century when it was sold to a committee specialized in restoration, later to pass into the hands of the state and open its doors to the public. In its basement, you can discover the Butler Gallery, a gallery dedicated to different works of contemporary Irish and international art.